Please join us for our 25th Annual Golf and Tennis Outing on Monday, May 6, 2019 at the beautiful Scarsdale Golf Club in Hartsdale, New York. Epiphany parents, alumni, and friends enjoy bunch, followed by a full day of golf and tennis. Players then have a chance to relax and celebrate their day on the course with a cocktail hour and dinner reception featuring a live auction traditionally emceed by our School President, Mr. Jim Hayes! In honor of the 25th Anniversary of our Golf Outing first time participants will receive a $25.00 discount on the registration fee. The discount applies to individual golfers and tennis players. 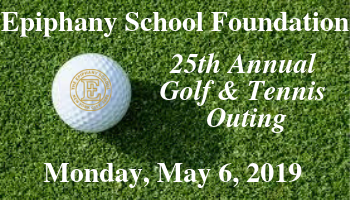 Please contact the Foundation Office at golf@epiphanyschoolfoundation.org to receive your promotional code.